With 33 interchangeable strings and vibrant vocal harmonies, Ginstrings is an acoustic progressive string band driven by an indescribable passion for music. Comprised of members who draw from diverse musical backgrounds, the group comes together to create a sound that reflects just that. While a shared love for music, collaboration, and the human experience gives them a constant desire to search for sound and create something new, a combination of optimism and realism keeps their feet on the ground with a healthy dose of head in the clouds. These boys have been tearing it up since 2012. Eli Bentley (banjo, dobro & vocals), Gavin Haskin (mandolin, fiddle & vocals), Jon Miller (guitar & vocals) and Matt Blake (bass & vocals) round out the quartet. 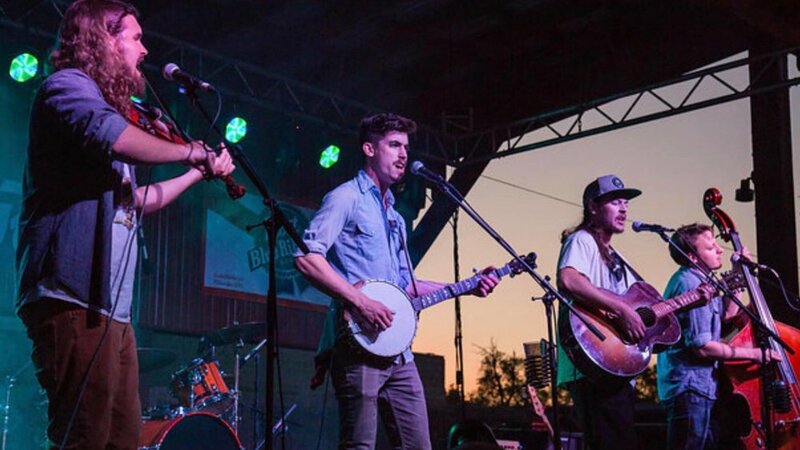 After the 2014 release of their self titled album they had the honor of receiving 1st place in the 2016 Northwest String Summit band competition and had since been working towards a second album. Named after the title track "Don't Leave Flowers", the new release shows a definite evolution of the music and features Ryan Young of Trampled by Turtles on fiddle. From fast-paced rippers, to sultry ballads, to progressive tunes with odd meters and tempo changes... This album covers a lot of ground in just 45 minutes, and shows tremendous evolution. With two albums under their belt and a third on the way, Ginstrings is one of the hardest-working independent string bands out there and they've made it their mission to carve out a place for themselves in this vast macrocosm of music. Feed the Dog is an eclectic and action-packed, high-energy, jam-rock-grass band. The Appleton based group features masterfully crafted fiddle, Kottke like finger pickin' acoustic six and twelve string guitar, funky bass lines, and percussive soul. The band started in July of 2015 and has been relentless playing festivals, theaters, and clubs alongside regional and national touring acts. Freshmen album "Sheep" out now. Sophomore album "Tenderloin" recorded at Hyde Street Studios in SF, CA March 2018, released August 2018.